Water lilies (Nymphaea spp.) are a large group of aquatic plants, bearing stunning flowers that float on the surface of the water. 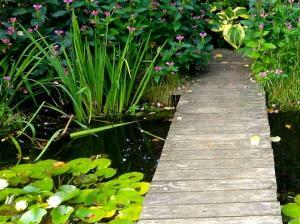 Their radiant blooms and serene floating leaves - lily pads - conjure up thoughts of a peaceful waterside paradise. Water lilies grow from tuberous root systems that must be submerged under water at all times. The cup- or star-shaped blossoms range from four to eight inches in diameter and come in almost every color of the rainbow. Individual flowers last a few days, but the plants continue to bloom on and off throughout the summer. Many varieties bear fragrant flowers. The floating leaves are circular and are usually as big as the flowers or larger. Use a broad shallow basin to house the roots of water lilies in your garden pond. A container two feet wide by eight inches deep is ideal. Place a few bricks on the bottom to keep it from floating and fill it with a mixture of potting soil and composted manure - water lilies need extremely rich soil to bloom well. Plant the water lily tubers horizontally about two inches below the surface of the soil mixture and spread a one inch layer of gravel or pebbles on top of the soil to hold it in place when it is submerged. Place the container in the water garden so the top is about 12 inches below the surface of the water. Water lilies have very high nutrient requirements. Because they are submerged underwater, ordinary fertilizer is not an option - it would make a mess of the water garden. Instead, check your local garden center for fertilizer tablets intended for aquatic plants. These are designed to be pushed into the growing medium. Check the directions on the package for how far apart to space them in the container; they typically need to be replaced on a monthly basis during the growing season. 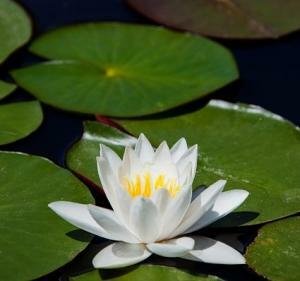 Spent flowers and dead leaves can be removed periodically, but otherwise there is little in the way of seasonal maintenance with water lilies and pests and disease are not an issue. Every few years the roots can be divided to prevent them from crowding their container. 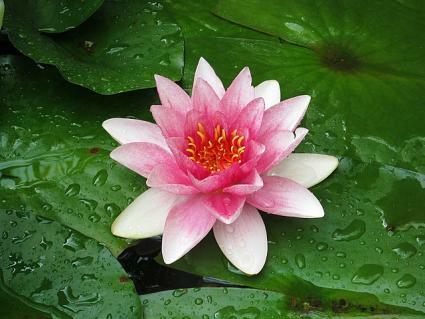 Water lilies are commonly available with the aquatic plants at local garden centers. There is an astonishing selection of flowers colors, some with unique patterns on the petals. All are hardy in USDA zones 3-11. 'Comanche' has six-inch flowers that morph from pale yellow to gold to deep orange as they open. 'Virginalis' has highly fragrant four-inch pure white blooms with bright yellow stamens. 'Attraction' has red and pink petals dotted with white splotches. Frogs are often found lounging on the flat pads of water lilies, while dragonflies zip around water surface, hunting for smaller insects. Water lilies are shockingly beautiful, but they are also key members of any aquatic ecosystem.